What would happen if a school eliminated the “tracks” that rank students based on their perceived intellectual abilities? Would low-achieving students fall behind and become frustrated? Would their higher-achieving peers suffer from a “watered-down” curriculum? Or is tracking itself the problem? A growing body of research shows that tracking doesn’t increase learning for the minority and low-income students who are overrepresented in low-track classrooms. This de facto segregation has led many civil rights advocates to argue that tracking is turning back the clock on equal education. As a principal at a New York high school, Carol Corbett Burris believed that the curriculum for the best students was the best curriculum for all. She helped lead a bold plan to eliminate tracking from her school, and the results couldn’t have been further from the doom-and-gloom scenarios of tracking proponents. Instead, there was a dramatic improvement in the achievement of all students, across racial and socioeconomic divisions, and a near elimination of the achievement gap. Today, due to those efforts, International Baccalaureate English is the twelfth-grade curriculum for South Side students, and all students take the same challenging courses, together, to prepare them for college. In On the Same Track, Burris draws on her own experience, on the experiences of other schools, and on the latest research to make an impassioned case for detracking. Not only does the practice of tracking fail to benefit lower-tracked students, as Burris shows, but it also results in the resegregation of classrooms. Furthermore, she argues that many of today’s popular reforms emanate from the same “sort and select” mentality that reinforces social stratification based on race and class. 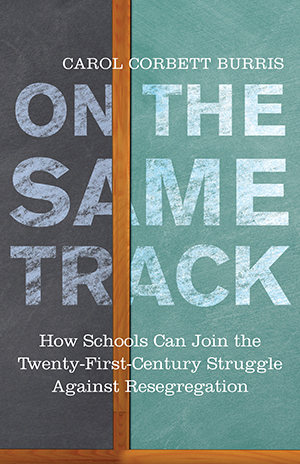 On the Same Track is a rousing, controversial, and yet optimistic account of how we need to change our assumptions and policies if we are to live up to the promise of democratic public education. Only by holding all students to the same high standards can we ensure that all have the same opportunity to live up to their full potential. When I first sat down to write this book, I was conflicted. What more was there to say about tracking? So much research has accumulated across the decades on how tracking stratifies our schools by race and class. Countless studies have shown its depressive effect on the achievement of students in low-track classes. Sociologists have done an excellent job explaining the factors and beliefs that support its continuance, describing in detail the way that prejudice, power, and privilege keep it in place. What relevance would a book about a practice that has been around since the beginning of the twentieth century have for educators and parents of the twenty-first century? The more I thought about it, however, the more convinced I became that what we have learned from studying tracking can and must inform our views of what is happening in schools today. The beliefs and assumptions that support tracking are the same beliefs and assumptions that are driving current school-reform efforts. The sorting of students by test scores, school-choice policies that result in racially stratified schools, and the abandonment of integration in favor of highly segregated charter schools threaten to take us back to the days of “separate but equal” education. Every book is born in time, and this book is no exception. I wrote it during the most tumultuous period for public schooling I can remember. Indeed, many public school educators and education researchers wonder if public schooling as we know it will survive the latest wave of reform. This turmoil has occurred because the leadership for school reform has shifted from educators and schools of education to the private sector and politicians. By financing think tanks and advocacy groups, America’s financial elite, including Michael Bloomberg, Bill Gates, Eli Broad, and the Walton family, now have a more powerful influence on state and national education policy than do district superintendents, teachers, and education researchers. Private sector investors have made vast fortunes in the marketplace, and it is the ideas and values of the marketplace that they bring to education reform. The two buzzwords most often associated with twenty-first century reform are accountability and choice. Accountability is measured by student test results. Choice is realized through school voucher programs, charter schools, application processes, admissions testing (“test-in” schooling), and lotteries. They work hand in hand. School quality is determined by student test scores, which in turn drive the parental decision-making process. Teachers are evaluated based on test scores and sorted into groups for censure, possible dismissal, and reward. The belief of contemporary marketplace reformers is that eventually the free market will ensure that only excellent schools and excellent teachers survive. Like tracking, market-based reforms are a sort-and-select system. But will sorting and selecting make our schools better? No reasonable educator would argue that test scores should be ignored or that school and teacher quality do not matter. However, an unintended consequence of choice policies is that some children are left behind--the ones who do not make the score cut and are retained in their grade, the ones whose parents do not have the time or resources to make an informed choice. And what happens to the neighborhood school that is not chosen? As high achievers move out of a school, school achievement plummets and the school begins a downward spiral, often leading to eventual closure and the displacement of students. If teachers and principals are evaluated by means of student test scores, where will they be incentivized to teach and to lead--in struggling schools, or in those schools with a proven track record of success? If we pause for a moment and look at the research literature, we will find the answers to these questions. We already know what occurs when students are sorted and grouped for instruction by the practice known as tracking. As school-choice policies are implemented, entire schools become tracks by virtue of selective entrance policies and segregated neighborhoods. We are now engaging in tracking writ large, based on the misguided belief that competition is fair and that it will improve our schools. We have absolutely no evidence to indicate that either assumption is true, but nevertheless, politicians and policymakers forge ahead. In this book I argue that the impulse to sort and select students (and schools) and put them on separate trajectories is one of the foremost contributors to the achievement gaps found in our public schools today. Indeed, I will argue that if we are ever to accomplish what we hope to accomplish--true school reform that addresses the needs of all children--we will have to stop the sorting of students and build strong, diverse schools and classrooms. The effects of sorting are clear when it comes to race and socioeconomic status. Study after study has shown that in schools, as in districts with diverse student populations, tracking results in racial stratification and lower achievement in low-track classes. In both integrated and single-race schools it results in socioeconomic stratification as well. Indeed, one of the arguments I will make in this book is that racial and class prejudice propels the creation of sorting systems and sustains their continuance. This was true in the 1980s, when education scholar Jeannie Oakes began her research on tracking, and it is true today. History tells us that separate is not equal. The effects of detracking are equally clear: when all students are given the highest levels of instruction, all rise to the challenge. In the first part of this book (chapters 1¬±4), I will review what we know about sorting students into tracks. I will discuss the ways in which educators have attempted to make tracking work and the problems inherent in such attempts. I will show how the sorting of students affects the composition of classrooms, and how it affects student achievement. I will also discuss the beliefs and prejudices that sustain tracking and other sort-and-select policies. The second part of the book looks at the experiences of schools that have implemented or attempted to implement detracking reforms. Some have made tremendous progress; others have realized incremental gains. One chapter profiles the Rockville Centre, New York, high school in which I serve as principal. The school realized significant benefits when it began giving all students access to the best curriculum in detracked classrooms. Detracking efforts are not without challenges. Detracking is a difficult reform to enact because it meets with tremendous resistance from those who receive (or believe they receive) benefit from tracking. Such resistance can be overcome, however, and strategies on meeting this challenge are also presented herein. Finally, this book will discuss how what we know about tracking can and should inform our present path of education reform. In moving ahead, caution is warranted, for the deleterious effects of sorting students are already emerging as unintended consequences of today’s market-based reforms. The stated goal of today’s reformers is to make all students ready for college and career. It is a noble goal, worthy of our embrace. However, it is a goal that can quickly devolve from “college and career readiness” to “college or career readiness”--with students being sorted into life paths as a result of policies that lead to greater inequities of opportunity. Unless sorting and selecting in all its forms is addressed, such a devolution is inevitable. This book is my attempt to help ensure it does not occur.